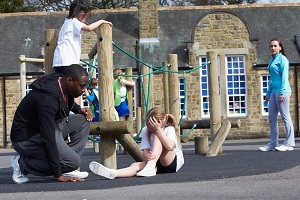 Panic, fear, and even guilt may have been the first emotions that you experienced when you received a call from your child’s daycare to inform you that your child had been hurt on the playground. As a parent, your primary goal is to help your child recover as quickly and completely as possible. Get immediate and ongoing medical care. A prompt diagnosis and treatment plan are important to your child’s physical recovery. After the initial visit, ongoing medical treatment may be necessary to help manage your child’s pain and to help your child heal to the maximum extent possible. Visit and take pictures of the playground. You want to see if there were any unsafe conditions, such as broken equipment, lack of fencing, or other factors that could have resulted in the accident that injured your child. Make sure that potential evidence is protected. This includes not only playground equipment, but also staff records about who was on duty at the time of the accident, how many kids were on the playground at the time of the accident, and other evidence. Get information about any adults who were present at the time that your child was hurt. It is important to get names and contact information for any adults—including staff and visitors—who were present at the time of the accident. Talk to a lawyer. An attorney can make sure that your child makes a fair recovery if your child’s playground injury was caused by daycare negligence. You couldn’t have prevented the accident that resulted in your child’s injury, but you can protect your child’s recovery by taking the steps outlined above. Your child’s doctors and the legal team at Gray and White Law can partner with you to make sure that your child’s recovery is protected. Our staff nurse and compassionate attorneys will work hard to get your child a fair settlement. To learn more about how we may able to help your child and your family during this difficult time, please contact us via this website or by phone to set up a free and confidential consultation. Who is legally responsible for my child’s injuries if my child was biten by a dog on a daycare playground?